What animal grows food, builds roads, constructs rafts, and even babysits its younger siblings? ANTS! While they might seem as different from humans as animals can possibly be, we actually have a lot in common with these creepy, crawly insects. From their families to their jobs, their farms to their construction work, ants are a lot like us. Featuring a dynamic mix of photographs and cartoon illustrations, Just Like Us! 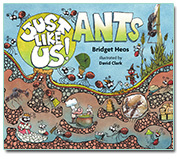 Ants will charm even the most reluctant nonfiction readers. What animal composes music, decorates its home, weaves, and even gives gifts? BIRDS! While they may eat bugs and lay eggs, we actually have a lot in common with these winged creatures. From their parenting to their homemaking, their fishing to their dancing, birds are a lot like us. Featuring a dynamic mix of photographs and cartoon illustrations, Just Like Us! Birds will charm even the most reluctant nonfiction readers. 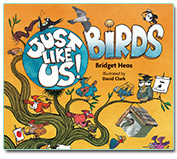 Get the facts on an array of leafy organisms and discover the unexpected ways humans and plants are alike in this installment in the Just Like Us! series from Bridget Heos, author of Mustache Baby and Shell, Beak, Tusk. With an appealing mix of photographs and cartoon illustrations.